Russian TV Academic Choir (Symphony 2); Ostankino Television Russian Academic Choir, Moscow Boys’ Cappella (Symphony 3); Moscow Choral Academy Children’s Choir, Moscow Choral Academy Mixed Choir (Symphony 8). 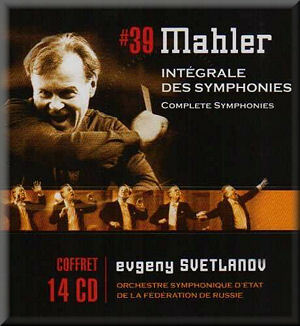 Re-released in a single box as part of the Warner ‘Official Collection’ for the recorded output of Evgeny Svetlanov, most of these Mahler symphonies first appeared on Chant du Monde. As you might expect, these Russian recordings have a different feel to the numerous alternatives on the market, and a good deal of water has passed under the bridge since the 1990s. Even just the past ten years has seen a marked improvement in orchestras beyond the ‘big name’ organisations who have already been under the microscope of the microphone for the last fifty years or so. While there are powerful moments and a great sense of promise with many of Svetlanov’s recordings there are always aspects which remind one that this is not a crack team quite as steeped in the Viennese Mahler tradition as one might hope. Interest is generated in an orchestra and an approach which has its own individual character, something which has to a great extent already been leached out of most if not all national orchestras today. As a representative of resistance against orchestral androgyny, Svetlanov’s Mahler is a potent statement indeed, and his fans will be glad to see this cycle made available in a single set. There are unfortunately too many factors militating against however, to put this set anywhere near recommendation as a library first choice. The Symphony No.1 is pretty decent, though the initial high harmonic from the strings does have a few squeaks revealing players a little less comfortable than others with their flageolet. There is a nice sense of atmosphere in this opening however, and I like the vulnerable feel to the horns as they enter at about 2 minutes in and the hunting call later on at 11:05 – not quite deciding on whether to play with or without vibrato. The pastoral feel of the rest of this first movement is cautious rather than really jaunty, with a few little blemishes like the flute ‘kick’ at 6:53. The second movement is more Kräftig than bewegt, being perhaps a little on the leaden side, but still a fair performance. The brass balance is a recurring issue in these recordings, with the trumpets cutting through with unnecessary fierceness. Woodwind intonation is another bugbear at moments throughout this cycle, and the tricky opening of the funereal third movement has a rather droopy bassoon solo, making the course steered by timps and bass all the more fragile. There is a good deal of ‘soul’ further on in this movement however. Mahler might not have had Cossacks as a mental picture for this piece, but they certainly sprang into my mind at times. The trumpet entry at 9.30 has to be heard to be believed, with such marvellously soggy vibrato to make one suspect the trumpets are taking the mickey. All the score says at this point is etwas hervortretend – or ‘with a little more emphasis’, not go completely mad with some kind of bizarre satire. The final movement suits everyone down to the ground here, with plenty of opportunity for rip-roaring bombast and plenty of soupy sentiment. Mahler’s Symphony No.2 is a piece for which I have something of a soft spot. I can go along with Svetlanov’s tempi for the first three movements, and there are numerous powerful and beautiful moments to enjoy, the perspective of the orchestra now more distant and the effects of the acoustic in the Moscow Conservatory Large Hall more pronounced. Where this symphony starts to wobble a little is at the very point it should start to lift one to the heavens. Olga Alexandrovna’s initial entry in the ‘Urlicht’ movement is a bit flat, and there are quite a few notes where a bit of a lift upwards would have helped. It all just about holds together, but not with any great feel of security, up until a rather gnarly bar at 4:34, where variance of opinion in intonation between the two harps is spotlit. I do love the sonorities of the chorale 7:19 into the final movement, and the power of the build up and climaxes further along are really terrifying. The Russian bass at the bottom of that choir really draws the ear as it enters at 21:11, and if you can stand wide vibrato that crucial soprano solo is nicely taken. The final section is however unfortunately almost entirely taken over by wobbly vibrato, to the extent that it is hard to hear which notes the soloists are singing at times. I’m sure the dark colour of that choir isn’t quite what Mahler would have had in mind, but its colour does make this performance distinctively Russian – at the very least it’s quite a few degrees more interesting than anything Gilbert Kaplan managed to achieve, even with the Vienna Philharmonic at his disposal. You’ll be glad to hear the organ is present at the final climax, but no-one can, or indeed dares to top that lead trumpet. It’s all a bit edge-of-the-seat, but in the end the pluses outweigh the minuses, even though the hairs might rise at the back of your neck for reasons other than normal. The soft spot I have for the second symphony is replaced by something of a blind spot for the daunting mound of music which is the Symphony No.3. Svetlanov’s is an impressive recording, not without a few relatively minor blemishes, but I enjoyed the first three movements immensely. I was expecting to be challenged once again by the fruity vibrato of the alto in ‘O Mensch! Gib acht!’, but was instead pleasantly surprised by some nicely accompanied and sensitive singing. The Russian quality of the vocal elements, choral and solo, are more emphasised in “Bimm, bamm”, but this is more an aspect of character rather than a criticism. The opening of the final movement is done with moving expression, and with only some minor brass intonation issues the penultimate tuttis and final climax are rich and powerfully effective. This is a recording which has made me re-consider my views on Mahler’s Symphony No.3, and for this my gratitude goes to Svetlanov and his Russian players. The Symphony No.4 is lighter in character, though Svetlanov’s tempo in the first movement lends itself more to Tchaikovskian expression rather than that pastoral jauntiness which it can have. This is nicely played however, and the transparent textures of the second movement are also managed well, a few moments of dodgy intonation aside. There is a nice sense of romantic sweep to the movement as it takes off around 6:30 in, and the violin slides are shamelessly juicy. The Ruhevoll third movement is marked as ‘poco adagio’, but Svetlanov takes it as a real adagio, sustaining to good effect and arguably lingering a little too long in places, though his timing is the same almost to the second as Bernstein’s 1987 Concertgebouw recording on DG. Collective string discipline is an issue at places, the slides at 5:30 being a case in point. Natalia Gerassimova’s solo in the final movement is rather close and not comfortably natural in the balance. With the entire orchestra almost obscured behind her voice it’s hard to warm to this part of the recording, although the performance is able enough. Ever popular, and with that bite which makes Mahler stand out from the crowd when it comes to turn of the century romanticism, the Symphony No.5 drags a little at the opening with Svetlanov, though once again his timing agrees with Bernstein’s Vienna Philharmonic version on DG. The music should indeed have a weighty funereal feel, and Svetlanov very much gives us that heaviness of tread – the long journey rather than any feeling of imminent arrival. Where the tempo picks up at 6:20 the first trumpet unfortunately takes over again, blisteringly distracting us from the rest of the orchestra and providing it with the extra colour of a New Orleans jazz band. The second movement Stürmisch bewegt is given plenty of vehemence as indicated in the score, and the playing is strikingly energetic and stormy for the penultimate passages. I quite like the character of the Scherzo, which takes the nicht zu schnell marking seriously and is generally more concentrated than convivial. The orchestra makes a fine sound here, held together by a strong horn section. The famous Adagietto is played with satisfyingly full and warm expression, though the strings can be a touch ragged between notes when exposed. I’ve heard that vigorous counterpoint a few minutes into the fourth movement done a little more cleanly, but it will do. The main body of the movement is effective enough, the brass cutting through triumphantly and the vast swings of contrast and texture take with deftness and even some wit at times. The Symphony No.6 returns us to that drier balance we had with the first symphony, and the opening is rather stodgy and earthbound. This is the first of the symphonies Svetlanov recorded, and Nina Svetlanova’s booklet notes indicate he was ‘virtually the first Russian conductor to perform Mahler’s symphonies in the West’. There are those who have pointed out that the Russians still had a great deal to learn about conducting Mahler at the time, but aside from being a bit opaque and disconnected in terms of recording quality this first movement could have been worse. The second movement Scherzo takes off at a terrific pace, pretty much ignoring the ‘pesante’ marking. The orchestra copes well enough, but is sounds too much hacked-though at critical points to be really effective. The Andante moderato is OK, but a bit too rough around the edges to stand as a contender. Around 6:40 is a section which sums this up, with a cheesy and unsubtle triangle, and cowbells which sound more like a child’s toy than the real thing. The Finale has some impressive drum thwacks and other good moments, but little irritation such as the suspect brass intonation in those outbursts in the third minute remove what is left of the gloss on this recording. Someone coughs at 2:50 and 4:00 as well, which is a surprise, as we’re not told that this is a live recording. The applause at the end clinches it. There is plenty of drama here, but not enough magic to contrast with the rest, so while this 6 would have made for a good concert it remains low in the pecking order for this set as a whole. The vast Symphony No.7 fares better as a recording, though is a trifle distant and generalised. The opening Adagio is a rather lumbering and baggage-laden affair, but we are picked up by a bracing Allegro con fuoco which has positive aspects. Intonation in exposed regions is a problem yet again in this movement, with a ‘low’ high note in the brass at 12:42, given the lie by an in-tune trumpet entry on the same note at 14:57. I can but imagine the dirty looks exchanged. Ragged strings and a loss of direction follows this, and I’m can’t say I was filled with confidence for the rest of this musical journey. The 1ste Nachtmusik is I’m afraid rather formless, Svetlanov’s grip on the fragile textures and material of the music more like a roaming rehearsal run-through than the definitive result of intense preparation. The Scherzo is a little firmer, though I’m intrigued as to who though the elephantine tuba entries at 1:25 where a good idea. There is a deal of wit in the detailed orchestration to this movement, though the somewhat vague recording quality misses a certain amount of this. The 2nd Nachtmusik passes without any great traumas, though makes little impression one way or another. The final Rondo blazes impressively and with a massive drum sound, and the movement is fine enough in its own rough-hewn way, though the bells at 10:52 and 16:30 seem more to announce the arrival of a train than represent any grand celebratory gesture. Disc 11 is further filled with the Adagio which was to have been the first movement to the incomplete Symphony No.10. This is a fine performance about which I have few complaints, though it is a fair bit slower than most and does drag on somewhat, and some daft violinist anticipates at the big chord at 23:35 like a musical sneeze. If the Symphony No.3 was a bit of a blind spot for me, Mahler’s Symphony No.8 is a bridge I’ve rarely crossed with equanimity. Whether you hear it as a sublime and magnificent creation or a grossly overblown statement of unmanageably melodramatic proportions and intent, this performance and recording is here to convince one of emphatically its validity and worth. I have to admit Svetlanov is quite in his element with these huge works, and the ‘Russian’ line which also takes us into the grander and more sprawling symphonic works of someone like Shostakovich can be heard like a sort of pre-echo in elements of the ‘Symphony of a Thousand’. Yes, the singing isn’t universally beautiful, but the choral moments are genuinely powerful and the orchestra rises to the challenge most of the time. The soloists are as usual liberal with the kind of vibrato which normally puts me off my hot chocolate of an evening, but here seems to suit the music and the proportions and scale of the performance entirely. Of these the men are most extreme. If set a solfège test to write down which notes the tenor Alexei Martynov was singing in the 15th minute of Part II, or those of baritone Dmitri Trapeznikov immediately following, then I would fail miserably. Each movement is on a separate disc and with no further access points, which may be considered an inconvenience. To my mind, the Symphony No.9 is Mahler’s masterpiece, and any recording has to be pretty hot to contend with the myriad competition available these days. Svetlanov’s recording has a funny quality which gives parts of the orchestra a strangely boxy sound and has rather an unnatural stereo picture. If this doesn’t disqualify it immediately it certainly makes it harder to evaluate in terms of artistic quality, especially for a headphone user like myself. There is not a great deal wrong or right with the first movement. The notes are all there, but it is full of weird moments and while I can’t say it held my attention particularly closely it does hold a kind of ‘horror’ fascination. A funny imbalance between left and right channel doesn’t help, and on a variety of systems I couldn’t quite reconcile the volume in the left channel with that of the right. The whole thing has a pioneering 1950s ‘adventures in stereo’ feel about it, and the really clunky moments like those in the tenth minute of the first movement are certainly not helped by the recording balance. The third movement is taken at a fiery pace which the orchestra can only just keep up with, so that’s pretty much a no-go area. The final Adagio has redeeming qualities and I love those expressive horn solos at 2:40 and 6:45. On the strength of this I think we should start a ‘campaign to bring back vibrato in French horns’. Impassioned strings and some moments of fine playing bring thus cycle to a respectable and at times noble close, but the phasey nature of the recording was turning my brain a funny colour by the end. This issue is perhaps not such a problem on speakers, but there shouldn’t be any limitations in this regard so no genuine Brownie points for this Mahler 9. To conclude, this cycle of Mahler symphonies was never likely to be an all-round champion, but did promise a different view on the pieces which, to a certain extent, it does. Part of the problem is price, which seems rather high for a re-issue at well over 50 GBP at the time of writing. You can have Haitink and the Concertgebouw on Philips or Rafael Kubelik on DG for about the same price, half a dozen excellent alternatives which undercut these, and Sir Simon Rattle on EMI for less than half. Admittedly my main comparative reference, that with Leonard Bernstein on DG, is also rather pricey, but does include all the orchestral songs and a remarkable standard of orchestral musicianship, even though you may not agree with everything Bernstein does with Mahler’s music. Evgeny Svetlanov was always an impressive conductor, and there are many impressive moments in this cycle. Unfortunately it has been left behind in every regard by one or other of the more recent alternatives, and also has to stand up to challenges from classic versions at lower price, so I certainly can’t recommend it as a first choice. Patchy intonation issues and some substandard playing and ensemble, a few cases of odd recording balance and wobbly singing all tell against, which is a shame since at its best this is a cycle which does have quite a lot to offer. I doff my hat to Svetlanov for winning me over to Mahler’s Symphony No.3, and, with regret, move on.